Kingdom Rock Vacation Bible School will take place June 17-21 from 9:00AM-noon each day at the Coal City United Methodist Church located at 6805 East McArdle Road. Registration will begins in April. Click below to download registration form and print. Forms will also be available to pick up at the United Methodist Church or New Hope Presbyterian Church located at 80 North Garfield Street in Coal City. Forms with payment should be returned to New Hope Presbyterian Church or Coal City United Methodist Church. Don't Miss VBS! The kids love it! Any questions please email ccvbs@hotmail.com Thanks! 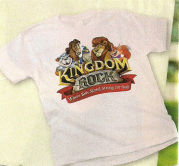 Everyone registered BEFORE June 1 will receive a FREE Kingdom Rock VBS T-shirt!